I love Margaret Wise Brown. She led a fascinating life, and wrote such wonderful books for children. I think it's safe to say that when we think of picture book authors, our favorites tend to be author/illustrators. The pictures usually come first in our mind. Margaret Wise Brown is an exception. True, her books were illustrated by some of the greatest in the business, but the words stand on their own. The girls and I can sit and recite Goodnight Moon at bedtime, and the gentle rhythm of the words is so peaceful that Clement Hurd's illustrations are merely a bonus. So... to the library! 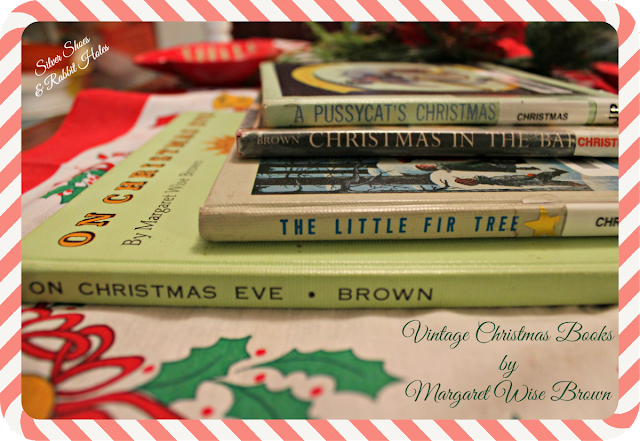 In my hunt to find vintage goodies from years past, I hunted down four vintage Margaret Wise Brown books. All have been reissued with new illustrations (one reissue is out-of-print), but you know me... If an oldie exists, I at least want to see it! The first two were illustrated by the amazing Barbara Cooney. Christmas in the Barn by Margaret Wise Brown, illustrated by Barbara Cooney. Thomas Y. Crowell Co., 1952. I prefer this one for the pictures over the text. I prefer the other Cooney collaboration for the story. The Little Fir Tree by Margaret Wise Brown, illustrated by Barbara Cooney. Thomas Y. Crowell Co., 1954. In part 2, I show off books illustrated by Helen Stone and Beni Montresor. I agree! I had to make sure I got picture in the post. Hee hee! So lovely! oh golly do I love me some MWB. She's the grand master of kid lit, I truly believe it. She was truly wonderful. Check out the Leonard Marcus biography about her sometime. She led a very interesting life! Barbara Cooney was a very popular author and illustrator! I wouldn't be surprised. :) The Little Fir Tree is my favorite of the four we checked out.